This week the Google Labs team spawned a brain child of Wave, and it’s called Shared Spaces. 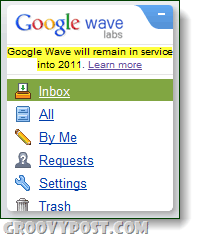 Google Wave, whether you love it or hate it, was the first innovative product to really challenge the entire system of email collaboration. Last August Google said they were ending support for Wave, but by no means are they killing it off. Even as we speak, Apache and open-source versions of Google Wave are in the works. What is Google Shared Spaces? 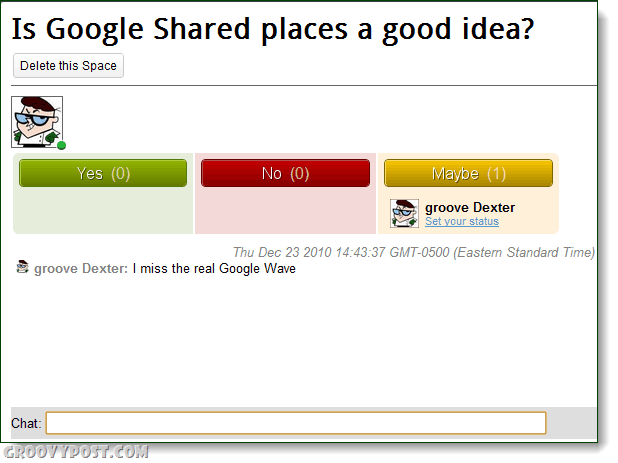 Google shared spaces is an online collection of web collaboration gadgets that resemble what you would see in Google Wave. You can login to use Google Shared spaces using a Twitter, Yahoo, or Google account. Once you create a gadget, it is assigned a permanent URL. What kind of Wave gadgets are available from Shared Spaces? Google started it out with quite a few, but keep in mind that not all of these gadgets were made by Google. In fact, many of the gadgets you’ll find on Shared Spaces come directly from the Google Wave community. Originally they were designed for use within Google Wave, but since Google has ended Wave, they now run all of these gadgets as their own stand-alone web applications. And from what we’ve seen so far, there are chat gadgets, Poll gadgets, games, charts, maps, and even Waffles. So just how many gadgets are there? A lot! If you Click on the very long screenshot to the left it will open a snapshot of what they’ve started out with. According to Google they won’t be discriminating against what type of gadgets are allowed, and anyone with a good one can submit their own creation to Shared Places and once approved it will be available for the whole world to use. What about Google Wave, you know, the real one? at Google, they will keep the wave.google.com up and running indefinitely. In other words they’ll keep it running “until a suitable replacement to host all your waves is available,” so Google definitely has something in the works. What information does the gadget developer receive? The developer of the gadget may collect information from you to provide you with their services. This may include information you explicitly provide as well as possibly information collected through cookies or other collection technologies. The information received by developers is not subject to Google’s privacy policies — please consider carefully the information you share in a Shared Space. If you have questions about what information the developer is collecting, you should contact the developer to learn more about their privacy practices. …when you log in and what Spaces you participate in, your activity on the Space(s) (including any content you post in a Shared Space chat), who you have invited to join the Space, and who has accepted your invitations. All of this information is stored in association with your Google Account (or whatever account you used to log in), and is necessary to provide you with the service and to properly display any content only to those people you have chosen to share it with. To help make spaces more social, Google also hosts a chat gadget for each space. Any messages you post into the chat can be viewed by anyone with access to the Shared Space. Remember that anyone in a space can share access to that space simply by sharing the URL. So regarding privacy on Google Shared Spaces, there really isn’t much. The only privacy you do have is that your URL is private until shared, and that if you are the creator of the particular space you can always delete the space and all of its contents. Google of course keeps all of your data for themselves as well, but if you use Gmail then they probably know everything about you already anyway. But, if you want keep your data out of 3rd party developer hands, just only use apps that are developed by Google. 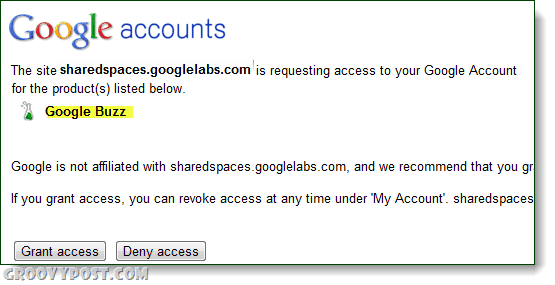 One other thing, if you use your Google account to login to Shared Places it will request access to Google Buzz. I’m not sure what the whole story on this is, so if anyone knows please drop a comment below and I’ll update this section with much appreciation! How do Google Shared Spaces Work? Despite being based off of Google Wave, all of the gadgets in Shared Spaces are standalone web apps. Each one is incredibly simple, just create a new Space and start using it. Each one is incredibly different and most of them have built-in instructions. One of my favorite is the poll gadget, if you’d like to see the Space I just created you can visit it here. 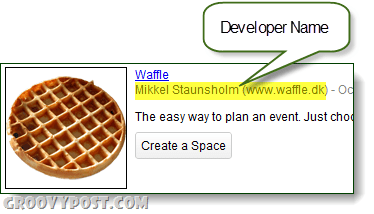 You can share Spaces directly from each one using the built-in Email, Buzz, or Tweet buttons. Alternatively you can just copy the URL address of your Space from your browser’s address bar and share it by any means you desire. Google Shared spaces is the next generation of Google Wave products to hit the web. Since it is currently part of googlelabs, there is a chance that Google will discontinue work on it as well. And if you ask me, Shared Spaces is a waste of time. What they’ve done is taken Google Wave, dissected it and split it into many different tiny chunks. Now instead of using all the gadgets within one easy and efficient interface, you have to open up different “Spaces.” This new project is Google Wave without the guts, and while it’s great for testing out the gadgets I can’t see this being useful while alienated from the core of the software. When you add in the fact that Google stopped development on the real wave, this makes me think this is just a shot at luring in 3rd party developers to take over. Try out Google Shared Spaces for yourself and let us know what you think!